JACKSONVILLE, Fla. — The Jacksonville Sheriff's Office is investigating a suspicious package on a JTA bus in the city's Mandarin area Friday, authorities said. 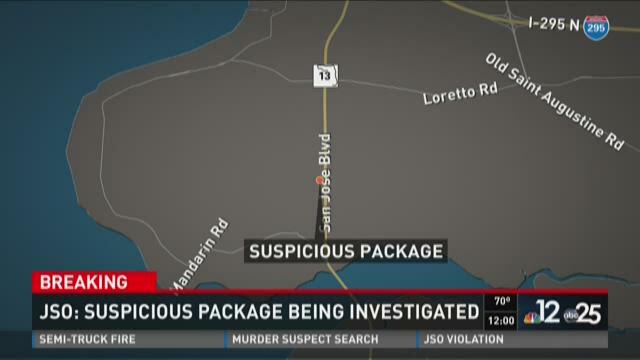 According to JSO, officers were sent to the intersection of San Jose Boulevard and Marbon Road after receiving reports of a suspicious package at around 10:30 a.m.
A JSO spokesman says a driver noticed the package when there was no one else on the bus. Police have no idea who the package belongs to, but a bomb squad carefully removed the package from the bus and transferred it to a safer location for inspection, officials said. All northbound lanes of San Jose Boulevard were closed due to the investigation. Traffic on San Jose Boulevard northbound was rerouted to Marbon Road eastbound to Aladdin Road and back onto Loretto Road, police said. Drivers traveling in the southbound lanes were being diverted onto Orange Picker Road.